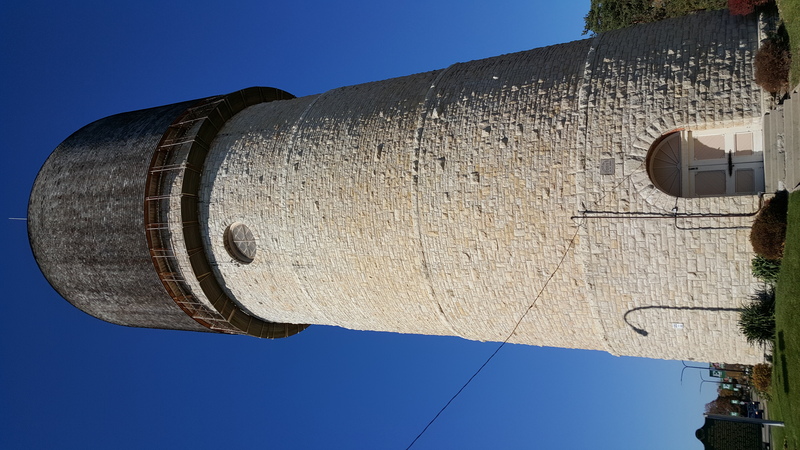 In #MittenTrip, Guides, Southeast Michigan. Geography is not my strong suit. I can point on my hand to the general vicinity of a few major cities throughout our great state (Grand Rapids, Detroit, and Mackinaw City), but everywhere else is guesswork. This may be part of the reason Ypsilanti had never been a destination for me, but an occasional landing spot on my way to Ann Arbor or Detroit. 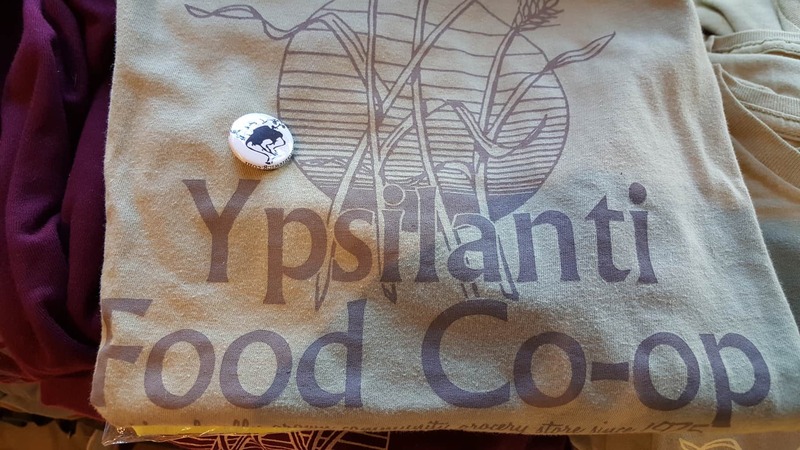 However, after learning I would be given the opportunity to spend a weekend in Ypsilanti for my #MittenTrip and researching the city, I found that it had its own very distinct, quirky identity that sets it apart as its own destination. 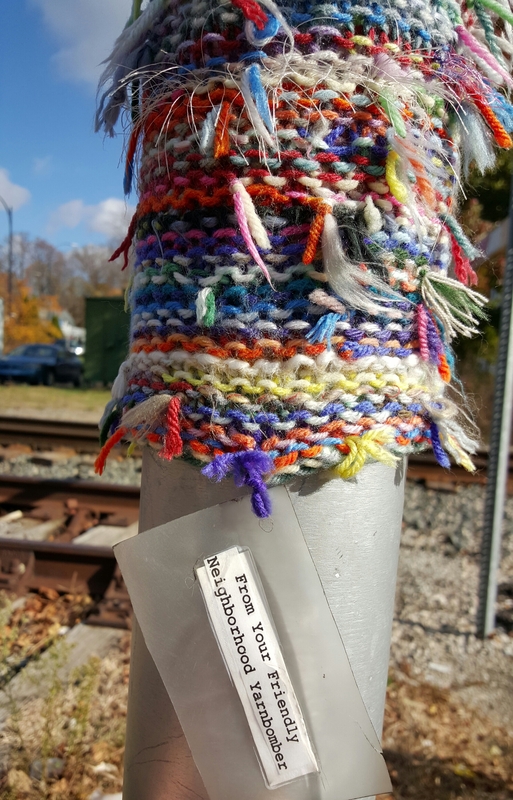 Ypsi is crawling with art, culture, beer, food, beautiful parks, and a great pride for the city’s history and the its future. After spending a weekend eating, drinking, and exploring Ypsi, I can say with certainty that the city is, like the delicious beer and food it produces, worth taking the time to savor. Although my wife and I had grand ambitions of leaving Grand Rapids early, beating rush hour traffic, and making a full event of our first night in town, we weren’t able to make it to the city until about 8:00 PM. After checking into our room at the Ann Arbor Marriott Ypsilanti at Eagle Crest (on the fancy concierge floor that you can’t even get to in the elevator without inserting your room key! ), we decided to set out for a late dinner. 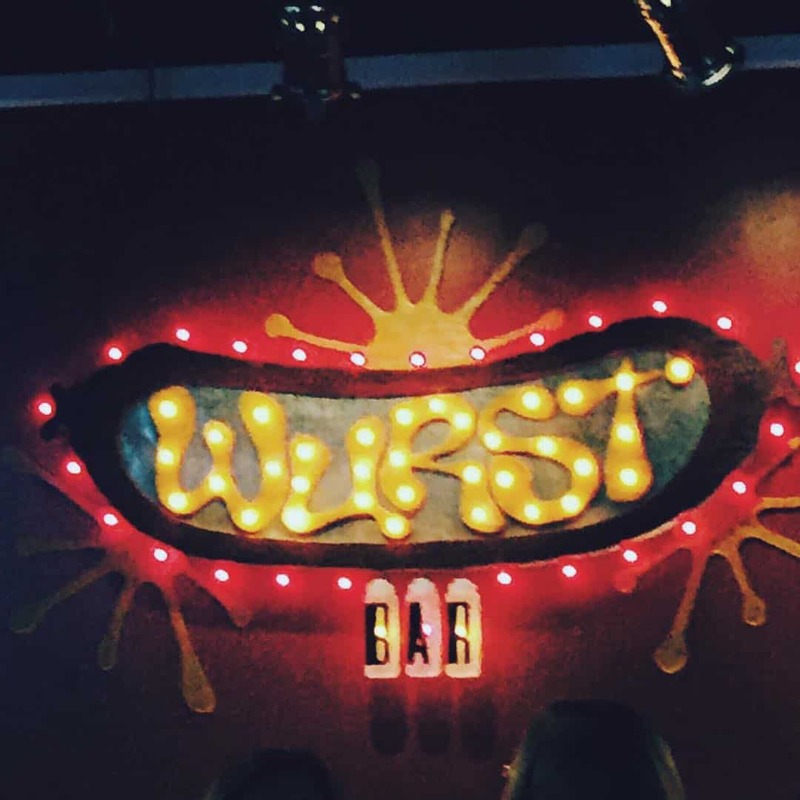 The Wurst Bar has only been open since 2012, but it already has the vibe of being a neighborhood staple. Even though it was a Friday night and plenty busy, we were seated immediately and provided with prompt, friendly service. With a nice variety of beer on tap (and a huge list of bottles), tater tot nachos, and a unique variety of sausages, including a Spicy Rattlesnake Chorizo and a vegetarian Hot Seitan Sausage, the menu boasts something for everyone. My wife and I split the vegan tots and vegetarian sausage topped with kimchi kraut, and took advantage of the Friday special: the Wurst Bar offers six craft beers for just $2.00 per pint from 8 PM to close on Fridays. With the bar’s eclectic decor, great service, and delicious and diverse menu, it is no doubt that it is loved by locals and tourists alike. Though we retreated back to the warmth of our hotel room after the late dinner, it should be noted that Ypsi offers an event called First Fridays where businesses around the city host free events on the first Friday of each month, including concerts and art exhibits featuring local artists. While December is the last month of the event before it is placed on hiatus over the winter, I will be making a trip back to the city in March when it resumes. When I woke up and pulled back the curtains on our hotel window Saturday, I was greeted by a perfect fall morning. The sun was shining, the grass was still green, and the last of the colorful leaves of fall clung to the trees on the Eagle Crest golf course. After grabbing a quick and tasty breakfast at the buffet of the hotel (free as a perk of our concierge level hotel room), we were ready to explore! The first item on our itinerary was a stop to the Michigan Firehouse Museum near Depot Town. We arrived at 9 AM, an hour before they opened, so we decided to take advantage of the nearby parks, enjoying the brisk fall morning. We began in Riverside Park, a nearly 14-acre park along the Huron River that connects downtown with Depot Town. While the park is host to many events in the warmer months, it provided us a beautiful and scenic walk. We crossed “the tridge,” a three-pointed bridge, into Frog Island Park to explore the outdoor amphitheater and vintage running track. Though I’m not in shape and was not dressed for the occasion, I couldn’t help but take a very light jog to enjoy the 5-acre park’s beauty. Adequately chilled by the brisk fall morning, we decided to warm up at Cultivate Coffee and Taphouse – the newest addition to Depot Town’s coffee scene. The non-profit business, housed in a beautifully renovated garage, focuses on serving great coffee and beer, community involvement, and investing in local and global gardening programs to fight hunger. I sipped on a delightful Kenyan pour-over while playing a game of Rummikub borrowed from their chest of board games. 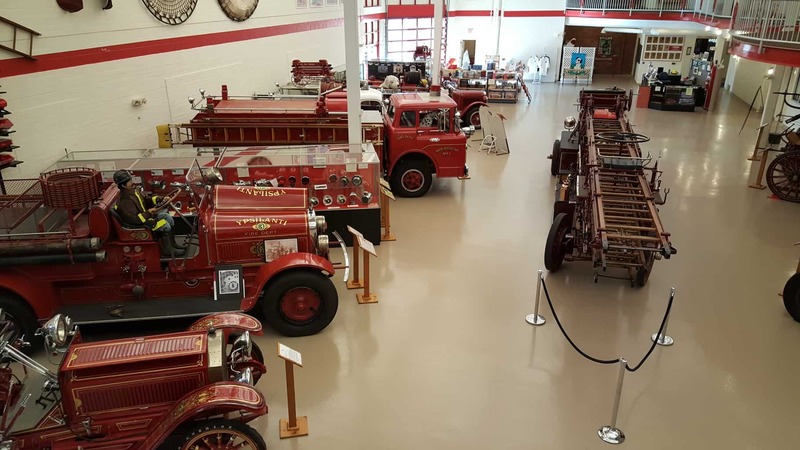 After losing the game to my wife, we ventured over to the Michigan Firehouse Museum where the $5 admission allowed us a self-guided tour of a wide array of historical fire “trucks” as well as the old firehouse itself. I loved walking through the displays and thinking about the days when firefighters were hauled to fires by horses and had to hand-pump water from ponds. Luckily we’ve come a long way since those times! From the Firehouse Museum, we made our way to Sidetrack, which was widely recommended as a “must” for any Ypsilanti trip. This Depot Town staple occupies a building that has housed a restaurant/bar for 150 years and has even survived being hit by a derailed train in its history. Though the line was out the door, it only took ten minutes to be seated and only took me three minutes to choose a beer from the extensive tap list (Dunegräs, an American IPA from Greenbush Brewing in Sawyer, MI). 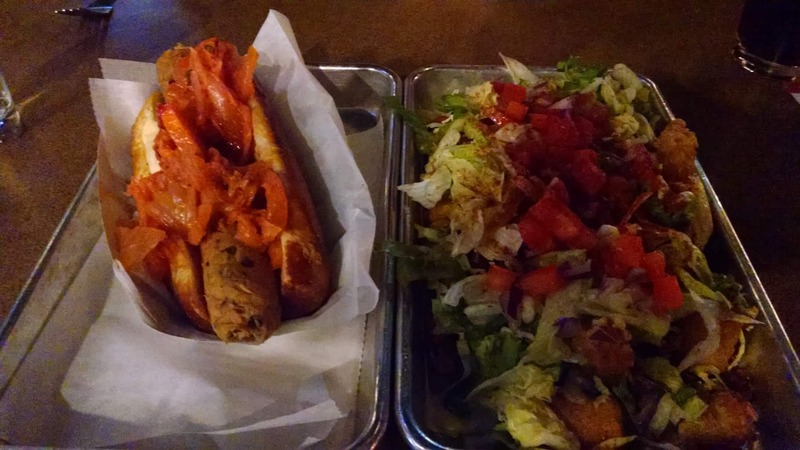 Though Sidetrack is most famous for its burgers, its vegetarian options were delicious. My wife and I both enjoyed our tempeh burgers and the exceptional French fries! Before heading on to continue our education of historic Ypsilanti, we stopped at The Eyrie, an artists’ market displaying a number of fun crafts and other products made by local artists and artisans. 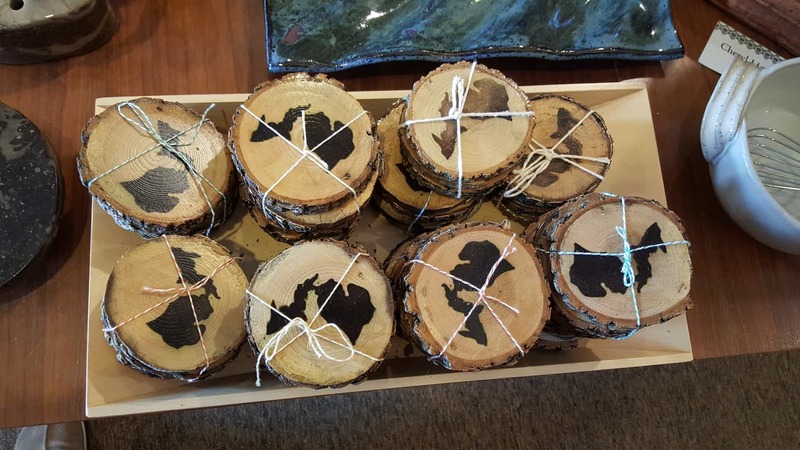 There were wood coasters with the etched outline of Michigan, beautiful paintings of local landmarks, and a variety of handmade soaps. While we didn’t end up buying anything, I could have spent much longer browsing the shelves! We caught wind that Short’s Brewing Company was offering a free tasting of some of their brews, including their new Starcut Ciders, at the Ypsilanti Food Co-op. After enjoying a few samples and a conversation with their representative, we enjoyed wandering around the store and looking at their wide array of goods, including a big assortment of local baked goods (that on any other weekend I would have been unable to resist). Our trip back in time continued after lunch with a stop at the Automotive Heritage Museum. The museum, a fully preserved 1930s car dealership, displays fully restored automobiles from four car companies with connections to Ypsilanti: Chevrolet Covair, Hudson, Tucker, and Kaiser-Frazer. 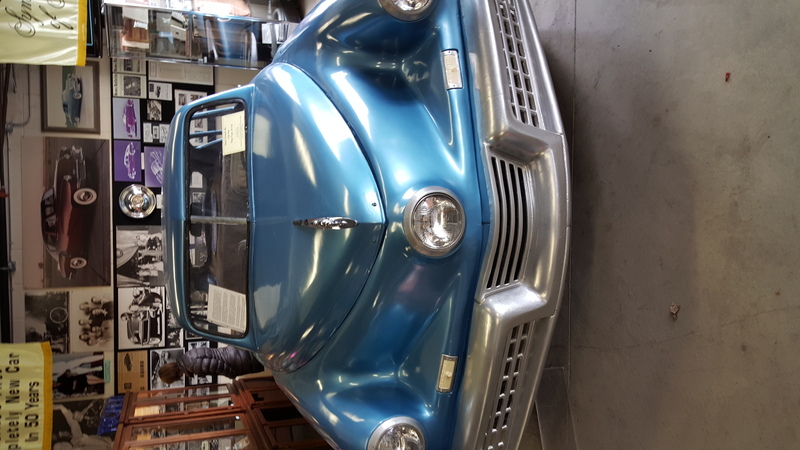 Though I’m not very knowledgeable about cars, I loved looking at the old vehicles, and the attention to detail it took to preserve them and the dealership that now serves as the museum. Though it only took 45 minutes for us to go through the museum, the $5 entry fee was well worth it! We had one last stop on our Tour of Ypsi’s Past: the Ypsilanti Historical Museum. 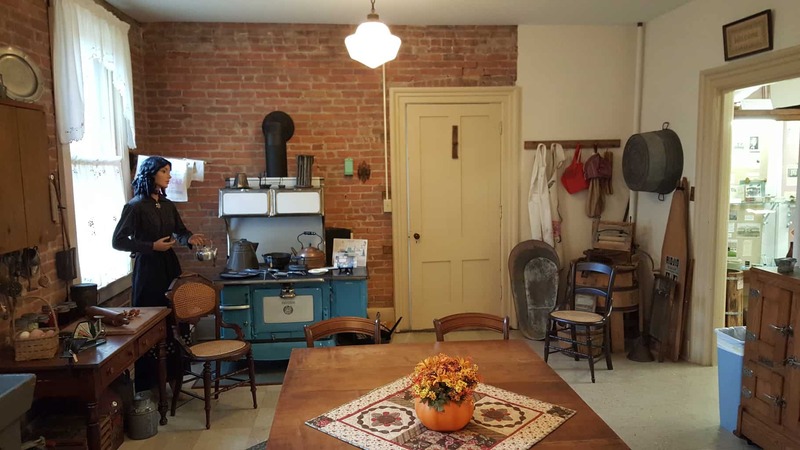 This free museum, funded by donations, is a delightful hodgepodge of local heirlooms and collectibles housed in a home originally built in the 1860s. Though the house has served as a number of things, including a boarding home for factory workers during World War II, the house has been meticulously restored and lovingly decorated. When we arrived, an adorable and knowledgeable volunteer docent showed us through the house, obviously taking pride in the things displayed there. While all of the museums were fun and interesting, I would greatly recommend the Historical Museum; hopefully you’re lucky enough to get the same docent we had! 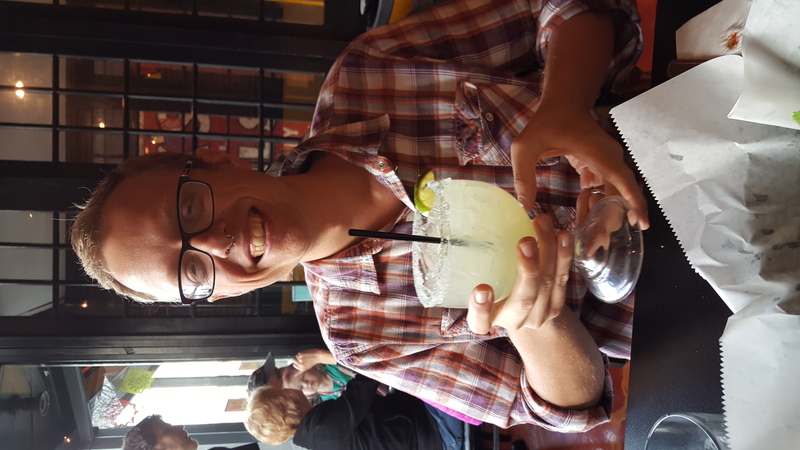 Since it had been at least three hours since we’d last consumed calories, we made our way to happy hour at Maiz Mexican Cantina. Another newcomer to the scene, Maiz serves fresh Mexican-inspired foods in a warm and inviting atmosphere. Half off Grande margaritas and half off appetizers was enough to have me humming “It’s Five O’clock Somewhere,” as I ordered cheese-stuffed baked avocados and a margarita. There were televisions in the bar where patrons were watching the Wolverines blow out Rutgers, delicious complimentary chips and salsa, and decor combining classic Mexican and modern elements. We both left talking about how we would like to go back for a full meal sometime soon. Full of knowledge, food, and beverage, we decided to head back to our hotel to watch a little bit of football while making room for dinner. We got caught up in “Gone Girl” on HBO before heading out for our last stop of the evening: ABC Microbrewery/Corner Brewery. The Corner Brewery, part of Arbor Brewing Company, serves a variety of sandwiches, burgers, and flatbread pizzas in a cozy neighborhood bar. After finding our own seats, we went up to the counter to order. The pub-style service allows you to order at your own pace, though it didn’t take me too long to go to the counter to order a couple beers (I got the Ypsi Gypsi Pale Ale) and the Dunkle’s Vegan Temptation – a vegan pizza topped with roasted garlic, thinly sliced potatoes, and a crisp cabbage slaw. The service was friendly and efficient, and we were in and out far more quickly than I would have expected on a busy Saturday night. Before heading back to the hotel, we considered going to B-24’s Espresso Bar for a quick pick-me-up, but decided that probably wasn’t wise as it was getting pretty close to our bed time (which is far earlier than it used to be!). While we had vouchers for the hotel breakfast again on Sunday morning, we decided instead to check-out a local Ypsilanti favorite instead. 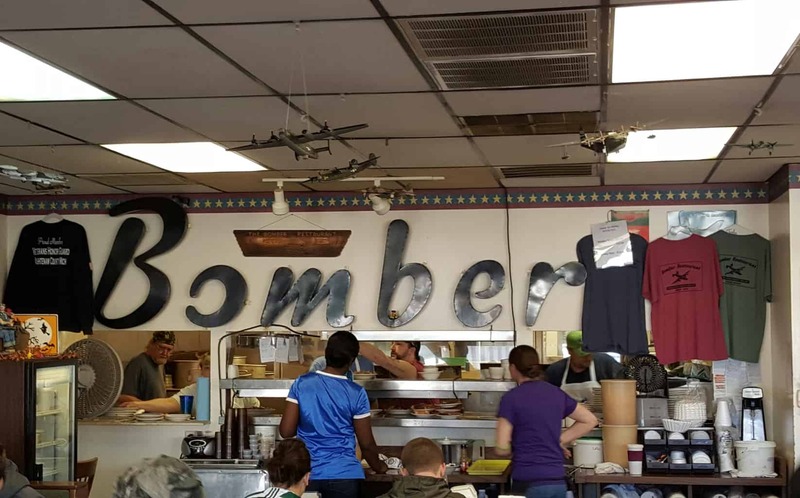 We made our way to Bomber Restaurant, a diner that also serves as a mini-museum to all things military. Model airplanes are hang from the ceiling, Word War II era weapons and a variety of military uniforms hang from the walls, and a number of vintage newspaper articles and advertisements are framed throughout the dining area. While their “Bomber Breakfast” has been featured on the Food Network as an “over-the-top breakfast,” (four eggs, a pound of hash browns, and a pound of bacon, sausage, or ham) we opted for meat-free options; I ordered the Greek Omelet with hash browns and an English muffin, and my wife ordered the “short stack” of the Nature Lover’s Pancakes, which were enormous and far more than she could finish (even with my assistance). Though obligations were beckoning us back home, we had a few more stops to make. Even though we filled up on typical diner coffee at breakfast, we couldn’t resist stopping by Ugly Mug for something a little tastier. I ordered a latte featuring local honey, and enjoyed sipping it while people watching (a lot of beards!). 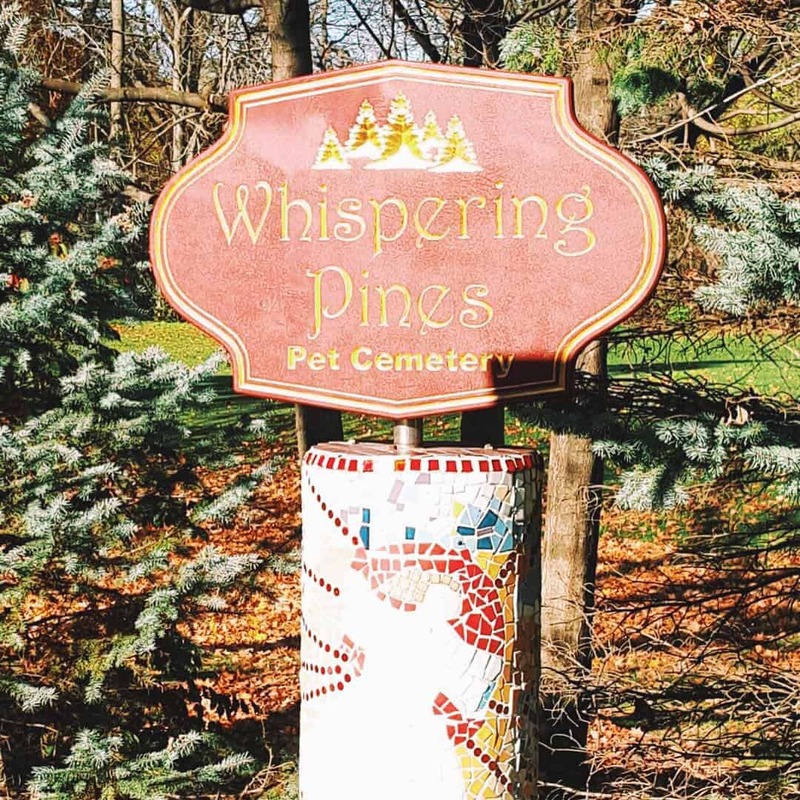 Since the morning had begun to warm up a bit, and we knew we had a two-hour car ride ahead of us, we decided to stretch our legs at the Whispering Pines Pet Cemetery. While it was entertaining to wander around the small, well-maintained cemetery and read the headstones of a variety of deceased pets (primarily dogs and cats, though we did see a few rabbits, one hamster, a bird, and even a ferret), I did almost tear up a couple of times while reading the heartfelt farewells written to these beloved furry friends. Finally, no stop to Ypsi is complete without a quick stop to take photos in front of the water tower! This interestingly-shaped structure, built in 1890, is difficult to miss and, like most everything in Ypsilanti, has an interesting history. While I greatly enjoyed learning about Ypsilanti’s past through my stops at the museums, new businesses like Maiz Mexican Cantina and Cultivate show that Ypsilanti has a promising and exciting future as well. 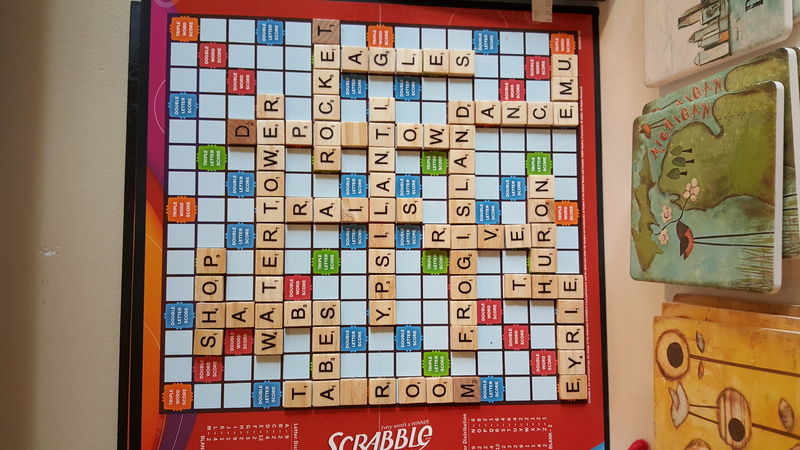 Special thanks to our sponsors for making our #MittenTrip to Ypsilanti possible: Verizon, AYYO Weekends, Shorts Brewing, Great Lakes Proud, and High Five Threads. Tagged ABC Microbrewery, Ann Arbor Marriott Ypsilanti at Eagle Crest, Automotive Heritage Museum, B-24’s Espresso Bar, Bomber Restaurant, Cultivate Coffee and Taphouse, First Fridays, Maiz Mexican Cantina, Michigan Firehouse Museum, mittentrip, Sidetrack, The Corner Brewery, the eyrie, Ugly Mug, Whispering Pines Pet Cemetery, Wurst Bar, Ypsi, Ypsi water tower, Ypsilanti, Ypsilanti Food Co-op, Ypsilanti Historical Museum.